11/15/2012 Round Rock, Texas – Dell announced fiscal 2013 third-quarter results today with revenue of $13.7 billion, GAAP operating income of $589 million, and GAAP earnings of $0.27 per share. Dell’s enterprise solution strategy continued to show positive results with server and networking revenue increasing 11 percent year over year. Mr. Gladden added that strong cash flow from operations generated over the past two years continued with $1.3 billion in the quarter and, combined with a strong cash position this fiscal year, helped enable Dell to invest in new capabilities and return almost $900 million year to date to shareholders through the company’s recently adopted dividend and share repurchases. Revenue in the quarter was $13.7 billion, an 11 percent decrease from the previous year as desktop and mobility revenue contracted. 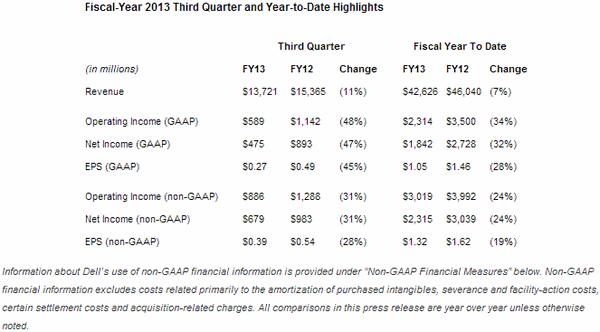 GAAP operating income for the quarter was $589 million, or 4.3 percent of revenue. Non-GAAP operating income was $886 million, or 6.5 percent of revenue. GAAP earnings per share in the quarter was 27 cents, down 45 percent from the previous year; non-GAAP EPS was 39 cents, down 28 percent. Cash flow from operations in the quarter was $1.3 billion. Dell ended the quarter with $14.2 billion in cash and investments. Dell Enterprise Solutions and Services revenue grew 3 percent year over year to $4.8 billion. The company year to date is 4 percent ahead of last year’s ES&S revenue at $14.2 billion, accounting for greater than 50 percent of the company’s gross margin thus far this year. The ES&S business is on an annual run-rate approaching $20 billion. Server and networking revenue for the quarter grew 11 percent. Dell was the only top-3 server provider to have positive unit growth in the quarter. Dell’s server growth was driven by its new, 12th-Generation line, leadership in hyper-scale infrastructure solutions and an increase in customer adoption of cloud solutions for their IT requirements. Dell’s differentiated intellectual property and solutions have resulted in solid growth in this business. Dell’s Services business continues to execute well, with gross margin percentages improving sequentially for the sixth consecutive quarter, as the company focuses on the most profitable areas of the business. Growth in support, deployment and security services highlighted the quarter. 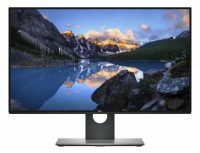 Dell sees the challenging global macro-economic environment continuing in the fourth quarter, which will continue to impact the company’s results. The company expects sequential revenue growth of 2 to 5 percent. For the full year, Dell maintains its expectation for at least $1.70 in earnings per share on a non-GAAP basis. Going forward, the company is committed to its end-to-end solutions strategy and creating value over the long term.